Skeptic Magazine's podcast Monster TALK has analyzed a "modern classic" in Bigfoot lore; the Jacobs Photo. 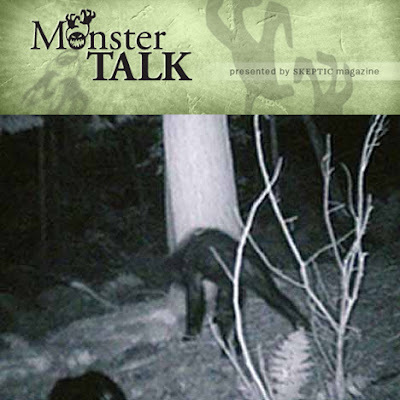 MonsterTalk is the science show about monsters—a free audio podcast that critically examines the science behind cryptozoological (and legendary) creatures, such as Bigfoot, the Loch Ness Monster, or werewolves. Hosted by Blake Smith, Ben Radford, and Dr. Karen Stollznow, MonsterTalk interviews the scientists and investigators who shine a spotlight on the things that go bump in the night. For once (and unlike mystery-mongering television shows) a monster-themed program gives skepticism more than just a couple minutes of lip service! You can read the episode notes below. We recommend listing to the MP3 podcast too. They also discuss the allometrics (limb proportions) argument, the copyright threats Blake Smith had to hurdle to do his analysis, and the plain honesty that this is a a very weird looking creature. At 20:02:16 photo of mother bear and one cub taken. The BFRO website labels this photo as “More of the Bear Cubs” but size analysis shows that the bear closest to the tree is the same size as the so-called “Jacobs Creature.” Of some interest, if you compare the size of the bear in the foreground to the cubs taken at 20:04:23 (below) you will see that the animal in the foreground also has to be an adult bear, not a cub! I didn’t notice this until preparing the notes for this episode. Trail Cam photo (right) taken by Rick Jacobs. Additional Analysis material (left) by Blake Smith. Copyright 2007 Rick Jacobs. Click image to enlarge. At 20:02:55 the adult bear and two cubs are photographed. According to the BFRO this next photo shows “The ‘Mama Bear’ image, showing “the bear cubs huddling around the mineral lick with a larger bear—likely the mother of the cubs.” They point out that in this color photo, the adult bear does not look mangy. That may be a result of the differences in the night-vision shots vs. the color/flash shots. The adult bear appears to be facing down the hill, away from the salt-lick and cubs. I’ve inset a photo of a similarly posed healthy bear to give an estimate of the pose. At 20:32:05 nearly a half an hour has gone by and the salt-lick has been tipped over. Are there no photos existing between these two time-stamps from a camera that takes photos every 30 seconds when motion is sensed? 20:32:05 is the first photo of the two “Jacobs Creature” photos. Several bear biologists agree that while this is a strange looking creature, it is likely an adult bear with mange. This makes the bear look thin due to loss of its thick coat, plus potentially emaciated due to side-effects of the mite infestation. It is likely the same adult bear from 20:02:16—but the other photos which show her do not allow the level of detail needed to observe emaciation; too much of her is hidden in the dark. At 20:32:41 we have the second photo of the “Jacobs Creature.” In the image below I’ve outlined what I think the photo really shows: an adult bear with a cub attempting to nurse underneath it. Note that if this pose is correct, it corresponds to the adult bear in size and orientation from the 20:02:16 photo almost exactly.